Explore the western side of São Miguel Island during this hiking tour. Follow your guide through the lush vegetation and discover a variety of native species. 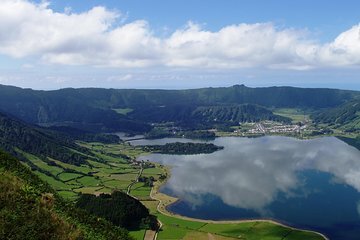 Stop at various viewpoints along the way including Sete Cidades, to see the Blue and Green Lakes, Santiago Lake, and the famous Vista do Rei. Enjoy a delicious lunch along the way and take in the beautiful panoramic views of the island. This was a wonderful day. From the moment I was picked up at a meeting point to the return, I found the walking demanding not beyond me at all, but it did involve some very steep inclines as we climbed the side of the crater but exhilarating. Sao Miguel is famous for cloud cover, so we caught glimpses of the lakes - sometimes - but that was part of the fun. Our guide was full of information and very helpful. We saw a LOT of cows. Sao Miguel is beautiful.